What if you could heat an entire room, or even a home, for that matter, using a simple roll of film? Believe it or not, Warmzone has once again outdone the competition with a roll of film that’s amazingly durable, thin and flexible that can do just that. Like all Warmzone radiant heated floor solutions, FilmHeat can be nailed or stapled to the subfloor. Its slim proportions make for incredibly easy, unobtrusive installation under laminate surfaces. FilmHeat floor heating systems are composed of three elements. The film element works with a power unit and activation device to deliver fast, efficient heat to any laminate surface in your home. Much like a forced-air system, the power unit, or “brains” of the system, communicates with a thermostat linked to sensors. Strategically installed in the floor, the sensors “sense” the temperature of the room and relay that information to the power unit to activate the system. This system is fully automated, responding to fluctuations in room temperature as they occur to deliver and maintain even, consistent heat in any room. In addition to being incredibly thin, the FilmHeat floor heating system is incredibly safe and can be installed in retrofit applications. You just need to be able to access the floor joists from below. FilmHeat is also one of the most efficient floor heating systems on the market. The lightweight heating element makes FilmHeat particularly easy to install. The elements paper-thin quality allows can be easily cut on site, and requires no floor buildup. So you can install it without major renovation, which is incredibly good news if you’re a first-time do-it-yourselfer contemplating a radiant heated floor home improvement project. If you’re hesitating on cost, initial installation costs involving FilmHeat floor heating systems are low. Of course the ease of installation makes the cost for do-it-yourselfers even lower. And like all Warmzone radiant heated flooring solutions, the system relies on a sustainable heat source, electricity, so it can run for mere pennies on the dollar. And in a time when the popularity of green living is growing, the FilmHeat floor warming system allows you to significantly reduce the usage of your primary heating system to realize greater energy savings while lowering your monthly heating bills. To move you even further off of the grid, the system can also be run by solar and wind power sources. It’s a positive contribution to your environment you can feel really good about. 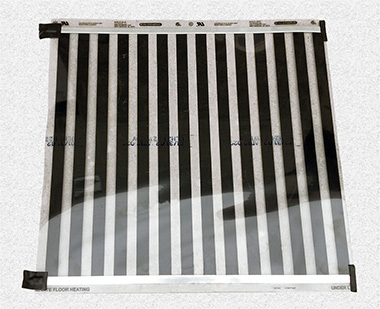 Interested in learning more about the power a roll of film can play in heating your home? Call Warmzone at 888.488.9276 or browse the website for more information on the wonders of FilmHeat floor heating systems. Friendliness – If I’m going to invest in a home improvement project, I expect the experience to be pleasant, at least. Helpfulness – I want an advocate, someone who knows what it means to go the extra mile for their customers. Knowledgeable – I don’t want to talk to a “salesman”—I want to talk to a radiant heat expert who can design and sell me a custom radiant heating solution. Responsiveness – If I leave a message or ask a question that can’t be answered immediately, does the rep call me back in a timely manner? Respectful – Regardless of my purpose of calling (whether to ask questions or make a purchase), does the rep treat me with respect? Listening Skills – I want someone to listen to what I need; evaluate those needs and then present me with options. Someone who knows how to ask the right questions. 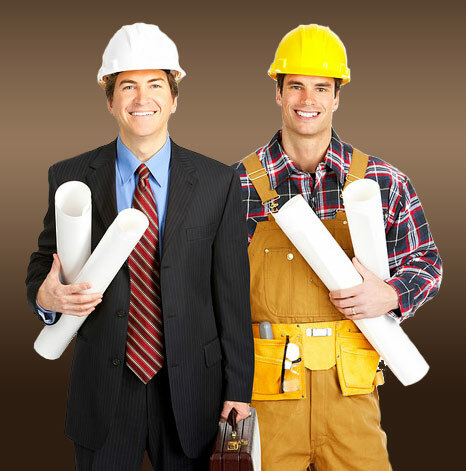 Professionalism – I need to feel confident in my choice of radiant heating solutions. Knowing the exact power requirements and performance expectations prior to any installation is critical. With Warmzone you can expect to receive complete radiant heat design and engineering services with each system you purchase. It would be hard for me to imagine a more knowledgeable, friendly staff then the staff at Warmzone. At Warmzone, the relationship doesn’t end with a purchase. Their experienced staff will work closely with you to ensure your radiant heat system is installed properly and performing as expected. Radiant Heat Product Manuals, Guides, Illustrations and more. Call 888.488.9276 to learn more or visit www.warmzone.com. Are you one of the many restaurant owners asking yourself “How can I improve my restaurant business in a struggling economy?” Many business owners are watching their once bustling eatery dwindle in happily paying customers. Consumers are tightening their own belts as a crummy job market and low economy hit many where it counts. This is leading to the dreaded trickle down effect that comes in a recession. Business owners everywhere are trying to find creative ways to convince spenders who want to spend more wisely, do so at their establishments. We are all fighting for customers so finding an extra edge is important when it comes to drawing them in. Outdoor portable heaters add ambiance and outdoor seating to diners craving fresh air without a “chattering teeth” sort of feeling. 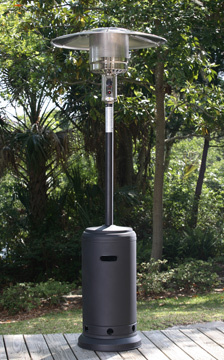 Portable heaters are ideal for warming outdoor dining areas. Walking around southern California recently, I was reminded again how valuable an outdoor heater could be to a restaurant. Many of us had flocked from our own wintery, white home towns, hoping to escape a bit of winter. While California isn’t blanketed in snow it still cools down significantly at night, but those willing and eager to spend their money on a warm meal at someone else’s table also want a bit of outdoor dining luxury. Especially if you are near the ocean. Listening to the waves crash and watching the sun set while sipping a nice drink is pure heaven in the winter months. As the sun sets and the cool air settles over the night sky, an outdoor heater creates a small glowing bubble of warmth around your outside dining area. Patrons seem to flock to these places that had created portable pods of outdoor heat, allowing people to soak in the beauty surrounding them but staying warm while doing it. As a restaurant owner, portable outdoor heaters set at key spots around your patio are likely to become your best friend. Is it true that only the rich and famous can afford to own a heated driveway? Chances are if you started asking around, more people than you might suspect already have a heated driveway. Heated driveways are not only more affordable than most people think but everyday Joe’s and Josefina’s like you and me install them all the time. Heated driveways are the most convenient and reliable way to remove snow each winter and you don’t have to ride a fancy high horse to see the many benefits of driveway heating. There are many snow melting options that make radiant heated driveway systems affordable for us all. The costs of a heated driveway should no longer be a legitimate reason why you don’t have this simple luxury. Warmzone representatives are available during business hours to speak with you and answer your questions about installing a heated driveway. They can also provide you with a price quote based on your specific snow melting needs, budget and installation option. If you are building a new home, installing a heated driveway is a quick and easy project for a professional. But even if you have lived in your home for years and suffered through back breaking snow removal, there is a good chance a snow melting system can be retrofitted beneath your existing driveway. The ritzy, glitzy population may have some fun toys and gadgets, but a heated driveway is not exclusive to people with gobs of extra money. But having a heated driveway may make you feel rich and famous. Word with “z’s” are fun. Say them with me…buzz, fizz, zipper. Installing heated floors means you can add a couple of “z” words to your conversations. You can subtly (or not so subtly) interject into conversations how you have jazzy and/or snazzy floors that produce epic warmth and comfort. You may get a few raised eyebrows or muffled conversations behind your back but you’ll be the one laughing as you walk merrily across your jazzy heated floors. Radiant heated floors are gaining speed in popularity and don’t just jazz up your floors but they save you money down the road as your energy bills diminish thanks to the efficient heating power. Heated floors have a lot of impact in cold basements, tiled entryways, bathrooms, and kitchens. These spaces usually have cold spots but with radiant heat the warmth oozes (another word with Z!) around every nook and cranny creating crazy (Z, la, la, la) comfort. Heated floors create a cozy place for you to walk barefoot and enjoy the new found efficient heat that radiant heat can offer. Even if you are not a fan of Jazz music, you can agree that jazzing anything up deserves a little celebration so put on a record and zip around your floor with nothing on your feet but radiant heat and jazzy joy. Can we all agree that the path of least resistance is the most desirable path? It’s not that we’re lazy, it’s just that, well…we’re smart. Right? Smart people find ways to do tasks faster and simpler. Here’s a tip on following the path of least resistance: Try installing a heated driveway. You can thank us later, but seriously, having a heated driveway eliminates all the heavy lifting you usually dread when the winter comes swinging in with its white fury. Following this path of least resistance allows you to kick back and enjoy the winter from the warmth of your family room. Driveway heating means that radiant heat cables will work on the snow removal quietly and effectively so you can enjoy more time with your family, working, and playing. Once you have driveway heating installed you simply hook up your automatic snow sensor and kick back while the snow melts seamlessly into your lawns and gutters. The heavy snow shovel full of mushy, wet snow is a thing of the past and suddenly you’ll find yourself actually enjoying winter. You might look forward to a big snow storm, taking in the sweeping views of white just outside your front window rather than cursing at the sky for adding one more thing to you to-do list. Driveway heating eliminates the heavy lifting for sure but it also eliminates the stress and strain on your mental and physical well being, because you don’t have to deal with any snow accumulation on your driveways or sidewalks.